Our Cabin was located on the edge of Palo Duro Canyon Palo Duro Canyon State Park. In September of 2002 my wife and I were on a tour of the panhandle. The highlight of the trip was two days and nights in Palo Duro Canyon. 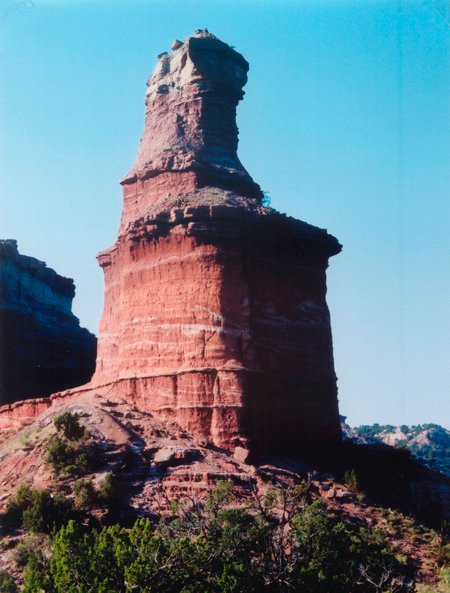 The Palo Duro Canyon reaches an average depth of about 800 feet and the average width is about six miles. The Canyon is sixty miles long. It runs from 15 miles south east of Amarillo in Randall County through Armstrong County and into Briscoe County. Palo Duro was carved the in the last million years by a river that has a great Texas name, The Prairie Dog Town Fork of the Red River. In the North end of the Canyon is the Palo Duro Canyon State Park. The state park has lots of campsites, everything from primitive sites to sites with full hook ups. We opted for one of the three cabins available at the park. 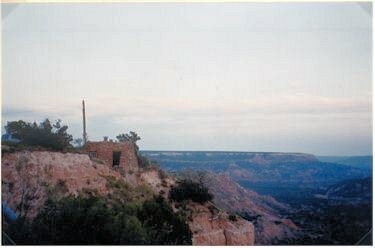 The Cabins are situated on the rim of the canyon and are made of native stone in 1933 by the Civilian Conservation Corps. The view from the cabins is nothing short of spectacular. Each cabin has a patio facing the canyon with a rock wall to keep you from falling in the canyon. They were all recently remodeled and will hold 4 adults. There are only three so make your reservations early. We arrived late in the day and after we moved and swatted a few dozen head of houseflies with my mouse pad, we watched a beautiful sunset drop over the western edge of the canyon. No TV, no phone, no hassles, we were off to bed early. Before sunrise the next morning we headed for the trailhead leading to the signature rock formation at the park, "The Light House." It was a relatively short, mostly level six-mile hike. The three miles to the "Light House" was a great hike shaded from the sun by the canyon wall with the last part of the hike was a lot of climbing up stair like trail to the viewing area of the "Light House." The hike back was later in the morning and in the hot sun. Take plenty of water with you. It was well worth the effort to get a close to the rock formations. Many years ago the park had installed a miniature train that took visitors to the "Light House", but probably for esthetic and environmental reasons it was removed and no trace can be found of it ever existing. In the afternoon we visited the amphitheater located in the park. During the summer month the musical production "Texas" plays in this theater. The price of the ticket includes a chuck wagon barbeque dinner. As you drive up and down the paved park road in the canyon there are many historical markers, things to see and lots of low water crossings over the river. Be sure and stop and soak your feet or what ever else in the "Prairie Dog Town Fork of the Red River". An old Indian legend says that soaking the affected parting in the moving water will cure warts, scaling skin, consumption, athlete's foot, mistle toe, the crud, the croup, and many other aliments. Now if you drink the water, that's another whole list of stuff it will fix or kill. 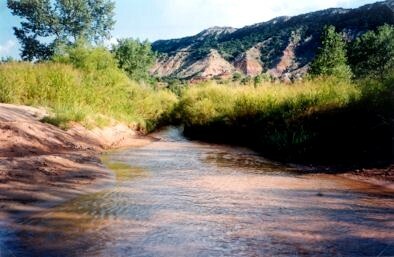 A great scenic drive that covers the southern part of Palo Duro Canyon and also crosses Tula Canyon. From Conway, Texas (Just east of Amarillo) take Texas Highway 207 south toward Silverton, Texas.